Treat your employees, co-workers, or yourself to playtime with a puppy or kitten. Snuggles and kisses included! Q: I just received a puppygram! Do I get to keep the puppy? A: You get to enjoy all the wonders of a puppy for 15 minutes. It is not yours to keep. You do get to keep the personalized card that came with your Puppygram. Q: But what if I fall in love with the puppy and want to keep him/her? 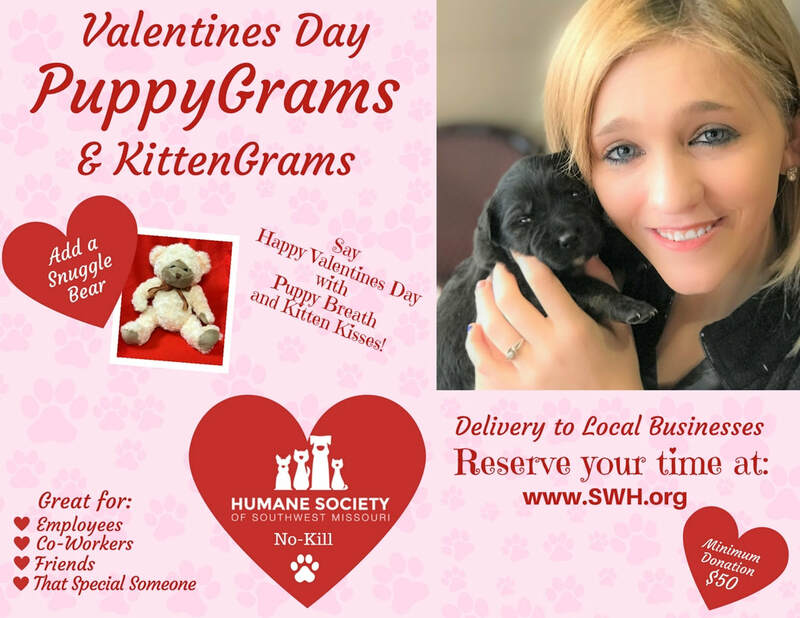 Q: Can I have a puppygram/kittengram delivered to my sweetheart's house? A: At this time we are only able to deliver to Springfield businesses. Q: What if the business does not allow animals inside? A: By placing an order you are confirming that the animal will be allowed in the building. We cannot issue refunds for puppygrams/kittengrams that cannot be delivered. If this happens, we will contact the recipient and try to arrange an outdoor visit. Q: Can I order more than one Snuggle Bear? A: Yes! Just make a note in your order of how many you would like and we will add $10 for each bear to your total. Q: Can I pay more than the $50 donation for my puppygram/kittengram? A: Of course! As an independent no-kill shelter we appreciate all donations. In the Questions part of the order form, just tell us how much you would like to donate! Thank you! A: You may email dmeyer@hsswmo.org or call 417-833-2526 ext. 213 with questions or special requests.